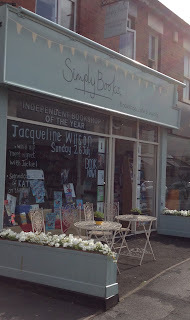 As random coincidences go, the final destination of my IBW2015 bookshop crawl is one of the more unexpected ones I've experienced, and I didn't even know about it until the following day, when I phoned my Dad to tell him about my travels. He politely listened, saying 'yes' and making agreeable noises as I talked him through the trip, telling him how much I'd enjoyed discovering the beauty of Essex and how friendly everyone had been. 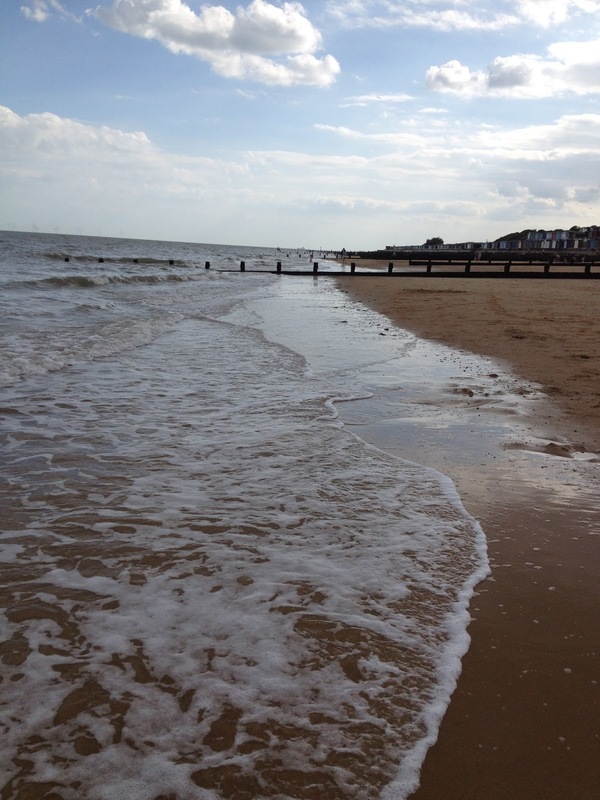 Then I mentioned Frinton-on-Sea and all of a sudden my Dad actually began to listen. But only for a moment, before he began talking non-stop about his mum. Ordinarily I'd be offended by the blatant lack of interest, followed by hijacking of the conversation for a person's own tale, but this time I was hooked. The story may have only been brief, but it was an extra element of family history I'd not heard before, about how in the 1920s my Nana and great aunt had left their north Wales home to go into service. The details are sketchy, from the decade I know they were teenagers, but I've no idea how much English the two girls understood as they began their journey across the country or even how long they stayed in Essex for. The only 'fact' is that they ended up working at Frinton-on-Sea, for a man who 'built radios'. Oh, and they enjoyed the experience. As their first experience away from home I can only imagine what an adventure it must've been, but what I do know is that they chose a beautiful place to end up. I may not have known about the family connection at the time of my visit, and I'm sure the town has changed a lot in the almost 100 years that have passed since my Nana was there, but I fell in love the moment I pulled up on the busy high street. The love only grew as I explored the town, met a very friendly bookshop and ended up on the beach, but I'm getting ahead of myself. First, the bookshop. 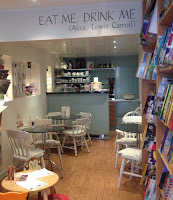 Caxton Books & Gallery is found on what felt like the high street of Frinton-on-Sea. Lined with shops, the road was just the right level of busy for 4pm on a sunny Saturday afternoon, meaning I found a parking space immediately and sauntered along to a beautiful bookshop front. Half art gallery, half bookshop, the window emphasises this perfectly, with a selection of paintings and books inviting you in. The split is then easy to appreciate, with books filling the front of the shop, leading to the open space of the gallery at the rear, although some art weaves its way between the books (which I'd argue are art in themselves). As I write, I'm struggling to choose one word to describe the bookshop. My first thought was light, because even where the shelves are close at the front it still felt bright and open. But then I remember my experience and think perhaps friendly is a more appropriate choice. Browsing the shelves, which include the delightful genre of 'cosy crime', it took me mere moments to choose my book when I stumbled across The Testament of Gideon Mack by James Robertson. Recommended to me by a northern bookshop, I'd long regretted not buying it and wasn't about to let the book slip through my fingers again. Of course, because I chose my book so quickly it meant I was swiftly distracted by the rest of my surroundings, in particular some cute mouse bookends adorning the children's department. Chatting to the bookseller as I struggled with that age-old problem of 'to buy or not to buy', I soon had the whole bookshop engaged in conversation as other browsers helped with my decision. It's no secret bookshops are one of the few remaining places where it's acceptable to engage strangers in conversation, but I've not experienced anything so all encompassing before. All I can say is that Caxton Books & Gallery's customers are ace. Oh, and obviously I bought the bookends. A painted pebble may also have made its way among my purchases – I needed something to remind me of the gallery side of the bookshop too. That it also shows blue skies and so reminds me of the rest of my day was simply an added bonus. Overloaded with purchases (technically I didn't break my one book per shop rule), I continued along the road to the seafront. Via an ice cream stall. A grassy bank along the Esplanade was the perfect place to relax as I thought back over my day of exploration and admired the view before making my way down to the beach, where the cool water, golden sand and the gentle sound of children's laughter ensured I fell even more deeply in love with Frinton-on-Sea. I didn't know about the tenuous family connection while I was paddling in the sea, but thinking back to that beautiful afternoon I like to imagine, once upon a time, two sisters might also have enjoyed such a visit to the beach on their day off. Splashing in the water and generally enjoying the adventure of life. This year, one of the many 'big' achievements I got to tick off my bucket list was to visit my first international bookshops. Admittedly, they weren't in Bermuda, the Mediterranean or even France (that'll be next year/when I win the lottery), but I can't begin to tell you my excitement as I walked through the door of my first Irish bookshop and paid for a book with Euros instead of pounds. At the time of writing about that particular bookshop I briefly touched upon the reactions of my fellow travellers, and their inability to understand why I'd want to arrange my exploration around the addresses of bookshops. However it's been a bit of a recurring question over the past two years (Happy birthday to The bookshop around the corner) and so I've decided to explain: everyone needs a hobby. I don't collect stamps or have a football season ticket, I'm not a regular theatre-goer and my music collection's hardly changed since Blur and Oasis were mortal enemies, but all those things take time and money. They take dedication and – if you're going to truly embrace your chosen hobby – enthusiasm. Which is how I feel about my bookshop travels. Where stamp collectors have the Penny Black I have Lutyens & Rubinstein, my football club is Newham Bookshop, for drama I'll one day make it to Aberystwyth Arts Centre Bookshop, and for live music there are Big Comfy Sessions at The Big Comfy Bookshop – also for every one of these bookshops I can think of another five that could easily be swapped in. On top of that I've met an amazing selection of characters, including Mrs Chicken, the fantastic Mr Fox, a psychogeographer puppet, my first four-legged booksellers Coco and Cassie, and in a couple of weeks I'll be telling you about a floppy-eared bookseller on a boat. You can't get that on the internet. Well, you probably can, but I'll bet it's not nearly so much fun. These bookshop visits have also taken me to new (to me) places. From the Peak District to Winchester, Alfriston to Hebden Bridge, some are areas I'd not previously heard of while others I'd long meant to visit but never quite found the time. All have meant extra ways I've explored this amazingly diverse country I call home. And there's been a lot of cake. Yes, there have been sad moments as I've watched the RIP list grow and even one of the strongest of bookshops closed, but on balance the highs have outweighed the lows. I'm sure most readers will agree I've picked up a pretty impressive book haul to help me remember all my adventures. And what books I've found, including a long sought-after cookbook for a relative, and The Stand for a mere £1.95. Not forgetting the stories themselves such as All my friends are superheroes, or even The Name of the Wind which broke me for all other books for a long time to come. I shouldn't have to explain my hobby, but I do so every week because like football, music or any other passion you may have, bookshops are a way of life – something that cannot be said enough. Thank you for continuing to keep me company. 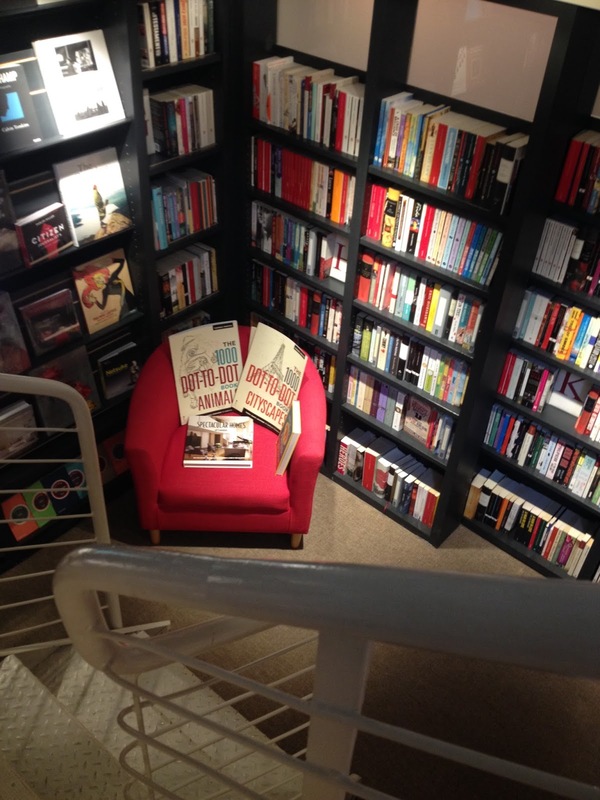 PS If you love bookshops as much as I do perhaps you'd like to join in and write a guest post? Reunions, weddings and christenings mean two things to me: A trip down memory lane and the chance to visit a distant bookshop. This week's destination combines two of those events, when a double family christening saw many of us reunited after (in some cases) years apart. It meant excitement at the thought of an evening with my sisters, a welcome opportunity to see my parents and the promise of catching up with my two cousins. I'm ashamed to admit that for once all thoughts of taking in a bookshop at any point during my visit were cast aside. The cousins – who are sisters and the parents of the two babies in question – are about my age, meaning I got to spend many happy childhood holidays visiting their home in Greater Manchester. We'd spend our days visiting the local swimming pool, baking cakes with our Nana, playing with their Duplo or watching Annie. Obviously the entertainment changed* as we grew up, but whatever those visits entailed, they were always fun. Nowadays we only see each other at weddings (theirs) and christenings (their children's). The contact is fleeting and I know very little about lives that were once so closely linked with my own, but rather than making me forget, I appreciate those brief visits all the more – I may not be part of their lives, but I am still a witness to the important moments. Which is why I was so excited to be returning to the area to meet their latest babies (a girl and a boy) and see the whole family gathered to celebrate them. After a seven-hour drive I arrived in the Stockport area, shattered but still enthusiastic at all the excitement to come. Then I took a wrong turn (I'll never become a fan of sat nav). In my panic to return to my planned route instinct kicked in and instead of attempting to reach my hotel by a different road I found myself automatically following roads from my childhood. And I accidentally found a bookshop. 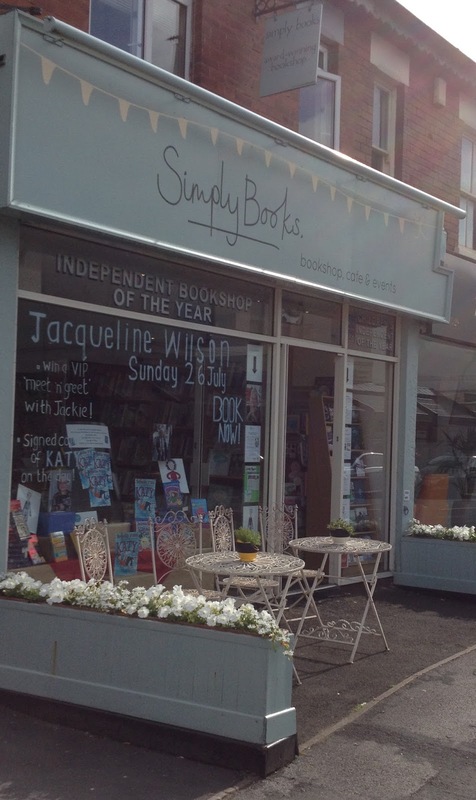 Simply Books is in Bramhall, a mere 15 minutes from the former home of the cousins I used to visit. Admittedly, this bookshop probably didn't exist back then, but when I saw the bright, welcoming shop front it no longer mattered that I wasn't pulling up at my hotel. 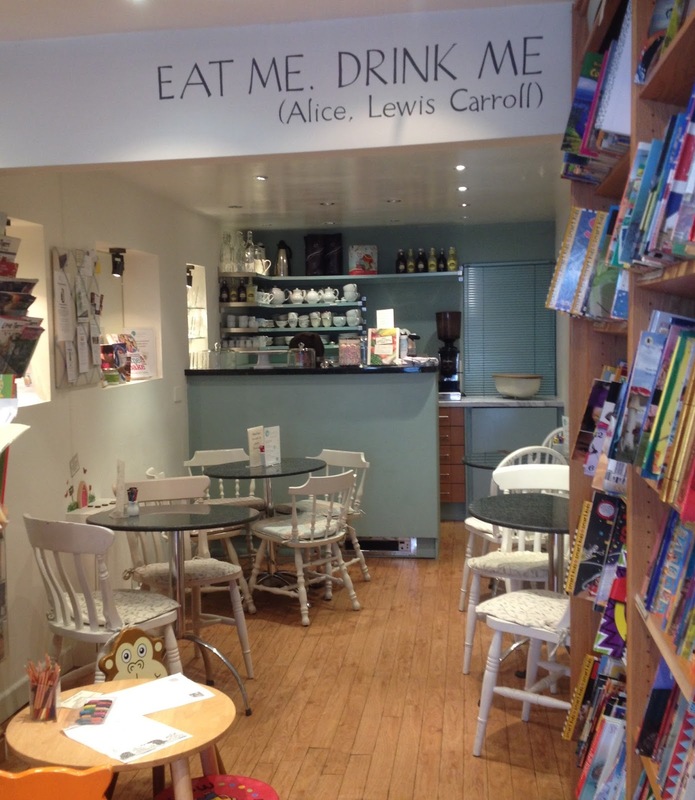 The first thing I noticed was an invitingly colourful wall of children's books, stretching back to a cafe where I'm sure parents must happily relax for a chat and a cuppa while young readers choose their next book. Opposite this, a large fiction section houses an out of the ordinary collection of recommendations, and a stunning mural leads the way upstairs. If the ground floor had felt large, the first floor was like a tardis. Finding space for a comfy couch, tables for more cafe visitors, gifts and an extensive selection of non-fiction, everything about the bookshop indicated space, light and happiness. Despite this calm and relaxing atmosphere, I struggled to find a book. The long drive – plus a few laps of memory lane – had left me exhausted and in need of help. Which is when a friendly bookseller came in handy. Having noted the brilliant selection of recommends (including a shelf of 'books I'm planning to read') I knew I was in safe hands when I asked for 'something light and fun to cancel out the very heavy hardback I'm currently reading'. Conversation followed, ranging from the subject of the weighty novel, our mutual Kent links and, obviously, books. When the bookseller casually asked what I thought of Jonathan Coe I had to confess ignorance; The Terrible Privacy of Maxwell Sim was swiftly recommended and sold. 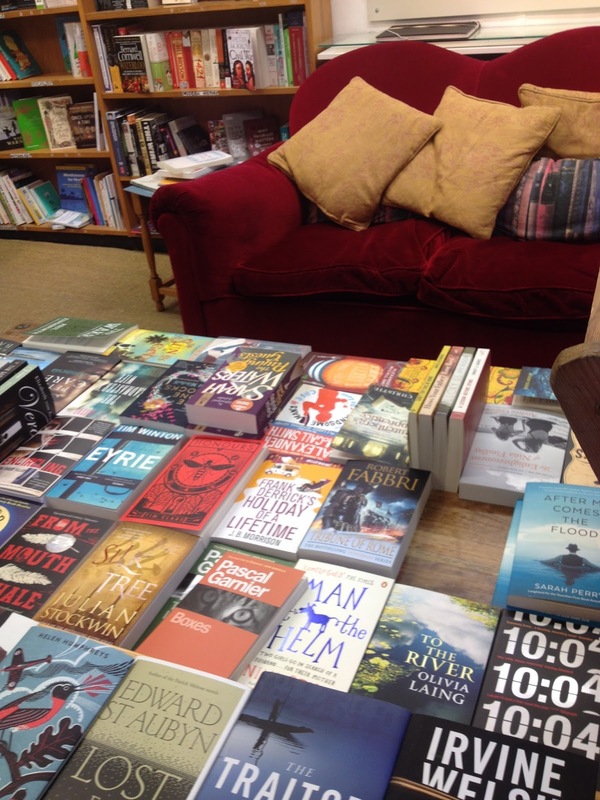 A bookshop may only have been an added bonus to a much anticipated weekend, but Simply Books – along with the book that's now a lasting reminder** of that weekend – were a very welcome addition. PS In case you're wondering, the babies were lovely and the catching up, although fleeting, was worth it. You know those days when you're in a mad rush, have a million things to do and not nearly enough time to get them done? Okay, so things weren't quite that bad, but I was in the middle of a bookshop crawl and panicking about how long it would take me to complete my journey. I was in a hurry. The problem with being in a hurry is that you don't necessarily take everything in. So while I'd noticed the big blue skies reaching out above me I'd not let myself stop to enjoy them. Equally, the countryside had passed in a gorgeous green haze touching at the edge of my consciousness with no pause to smell the roses. Then I arrived at my destination. It was closed for lunch. And I was still in a hurry. Or I at least felt I should've been. Thankfully, instead of panicking, I stopped, thought, and realised I wasn't really in a rush at all, I was on a relaxing day out. Admittedly it took an enforced pause to make me stop and realise that, but once the sign was spelled out at eye level I realised how important it was to just slow down and enjoy the beautiful village I found myself in. And have some lunch. 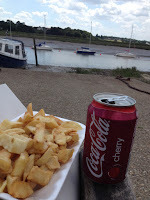 Knowing nothing about Wivenhoe in Essex – beyond that it's home to an independent bookshop – I had no idea where to find a cafe and so decided to simply keep walking along the road. As luck would have it this was very much the right thing to do, as within a minute I found myself at a riverside. 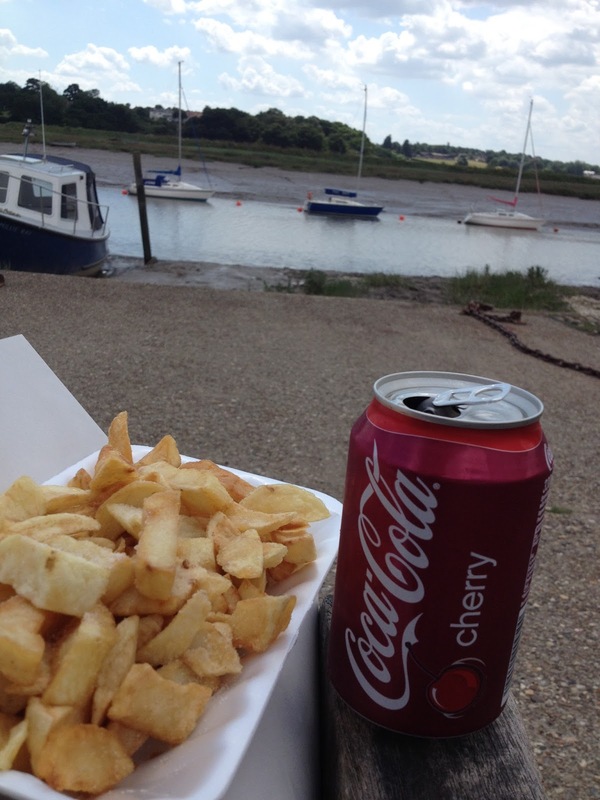 A friendly family directed me to the nearest chippie and I was soon settled on a bench, with a portion of chips (lots of salt and vinegar) and a can of Cherry Coke. The sun was shining, there were just enough people around to create a gentle buzz and the view was gorgeous. It was the perfect pause on my bookshop crawl, and helped to re-set my brain to the gentle pace of life in an idyllic village. Refreshed, I returned to Wivenhoe Bookshop and some welcome shade. A lovely little shop, my first thoughts after being greeted by the friendly bookseller by the door were that the two rooms of this establishment were exactly perfect for village life. Small enough to be manageable, while large enough to stock a good range, it really felt like the epitome of the local bookshop. 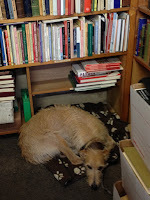 In the backroom where I dawdled away most of my visit the bookshop feels like the living room of a bibliophile, complete with comfy red sofa, large coffee table, interesting paintings and what looked to be a former fireplace full of non-fiction. From my seat on the sofa I could relax with a book from the coffee table or simply sit back and enjoy the wall of fiction in front of me – a wall that was close enough to read the spines without generating feelings of claustrophobia. 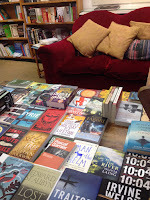 I could also enjoy the myriad conversations between visitors to the shop, not listening in as such, more browsing and overhearing as they floated through from the front room: snippets of village life, book conversations, book events, reading, writing and friendly hellos. Everything you'd expect from a bookshop at the heart of its community. Had I been in a hurry, the dreamy pace and leisurely conversations would probably have been a frustration, slowing me down as my frustratingly British manners would've forced me to wait rather than interrupt a conversation. Instead, it all added to the charm, reminding me why it's good to get out of the city and relax every once in a while. In fact, so slowed down had I become by village life that when I did speak to the bookseller I continued to dawdle, enjoying our booky chat and dithering over my selection. Then I spotted Anne of Green Gables by LM Montgomery and impulse grabbed me. Often recommended by a friend – and a sad omission from my childhood reading list – it seemed the perfect reminder of my rural retreat.